What is a Kidcot fun stop?? The Kidcot fun stops are located throughout the World Showcase. They are a great place to cool off, color and learn about the 11 different countries. Children will receive a cardboard Duffy to color on, place stickers on and they can use this to collect the 11 different stamps from each country. 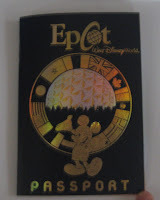 Or you can purchase a World Showcase Passport and collect the stamps from the different countries. There is even space in the back of the passport where your children can collect autographs. my children enjoyed collecting the different stamps from each country on their Duffy bears!